C.J. Hribal (a.k.a. – Juice Hardball) is a stone cold baseball freak. The kind of guy who can tell you who played third base for Cincinnati in 1990*, or who was commissioner when the designated hitter rule was put into effect**. I've talked with CJ at several residencies for the Warren Wilson College MFA Program, and the topic of discussion has always, sooner or later, fallen to baseball. Who made the right moves and who made the wrong ones in the off-season, which teams will fade down the stretch and, come on – what the hell was Dusty Baker thinking when he left Mark Prior in while the kid was obviously having a meltdown in the '03 NLCS? I mean, seriously. CJ also teaches at Marquette University in Milwaukee, where he is a loyal to the bone Brewers fan (although his childhood love for the Cubs refuses to die). 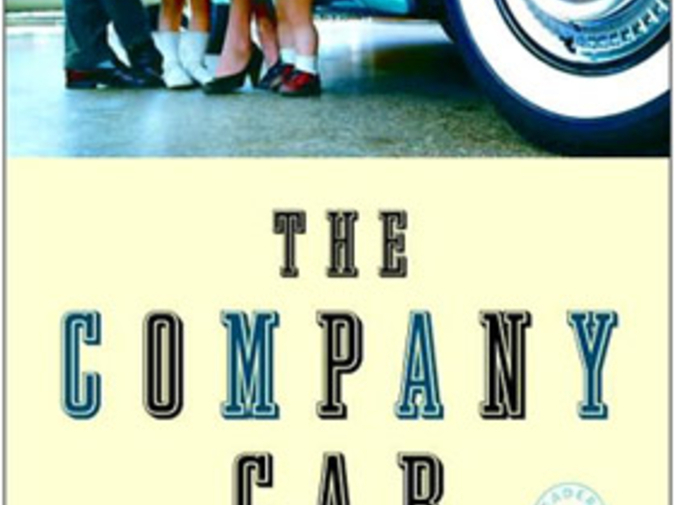 His most recent novel, The Company Car, deals with the very tender subject of the 1969 Chicago Cubs and their colossal collapse against the surging "Amazin' Mets." I had a chance to interview CJ on the upcoming season, as well as that whole writing thing, over the course of Spring Training, and never once asked him if his choice to cheer for the Cubs as a kid (instead of a real team – the White Sox for example) was a decision that basically ruined his life. You grew up (mostly) in Wisconsin, which put you in a nice little hub for baseball action. You had the Braves and then the Brewers in Milwaukee, the Twins across the border in Minnesota, and the two Chicago clubs (the White Sox and the Other Ones). But you also grew up with minor league ball, with the Appleton Foxes right in the neighborhood. How did your relationship to baseball develop as you grew up? Was it about specific teams, specific players, or just the game itself? I've been lucky – as a kid first growing up in Chicago, my father and grandfather fought for my soul by taking me to both Cubs games (dad) and White Sox games (Papa, my maternal grandfather). Eventually the northsiders won out, though for a long time my favorite player was Louis Aparicio (of the White Sox, later Baltimore, then the Sox again). He was a classic shortstop (my position) – amazing fielder, so-so hitter, the sort of player who functioned as the infield's glue. I had a signed Louis Aparicio infielder's glove that I used for years and years – eventually getting it signed by Ernie Banks, my favorite player of all time (till Kirby Puckett came along). I was a Cubs fan even after we moved to Wisconsin the summer I was ten. The Braves are remembered fondly in WI, but they were gone by the time we moved there, and Brewers (via Seattle) did not arrive until 1970. I still followed the Cubs, tuning in to WGN in Chicago to hear their West Coast games on a monstrous radio my father allowed me to move from his office to my bedroom. I lived and died with every pitch. My fate, as a scrawny, athletic, but insecure-in-his-maleness adolescent obsessed with baseball (a sport – this was before soccer swept the American suburbs – where a scrawny, athletic kid could be good) was so aligned with the Cubs that the summer of their infamous '69 collapse I had a minor (major?) breakdown in an alfalfa field one day in August when they blew both halves of a double-header by identical 4-3 scores. I could be misremembering the scores, but I remember the breakdown very well – I had a character in my novel The Company Car suffer a similar breakdown. In time I developed a love for the Brewers as well, which worked out fine since the Cubs were NL and the Brewers were AL. I could love both equally. I was also, as a kid, following the Appleton Foxes, then an affiliate of the White Sox. I don't remember the players from that era that well except for following one promising outfielder who was considered a "can't miss" prospect who got drafted, went to Vietnam, and got part of his hand, including his thumb, blown off by a grenade. I remember the incredible sadness I felt on behalf of that player, to have been deprived a chance to play major league ball. I wish I remembered his name, if only so he doesn't disappear into the anonymity of history. By the mid-70s the Brewers were developing some decent players, including one, Robin Yount (another shortstop), who was my age. At age 18 he was the starting shortstop for the Brewers. Unbelievable! Over time I've added one more team to follow and love – the Twins – because I moved to Minneapolis in 1983. My first two children were born in '87 and '91 – both years the Twins won the Series. I felt as though God was personally blessing my life. It turned out I was wrong, but that's another story. In terms of my love affair with baseball, it's been the sport itself, then the teams (the three I've mentioned), and then specific players, though my love for individual players is sometimes out of proportion with my love for a given team. Besides the big reason above (it being a sport where a shrimp like me could excel), I think I loved baseball for the reasons Ken Burns covered so well in his documentary – it so naturally follows the seasons, it's the only game that allows for infinity (don't make the last out and the game goes on forever), it combines teamwork with a series of epic, pitched, individual battles, it is defined, over and over and over again, by hope and heartbreak. The players I loved played for teams I loved, and I'm sure a lot of it was fueled not only by their success, but by their personalities as well, as least the ones on public display: Ernie Banks' enthusiastic "Let's play two!" and the joy of watching Kirby Puckett win games with both his bat and his glove. I'll remember the '87 Series forever because it was the first time I've cheered for a team that actually won it all in the post-season (the '82 Brewers were a Rollie Fingers injury away from winning that Series), but the '91 Twins-Braves Series has to go down as one of the classics of all time – every game an amazing story, including Puckett's winning game six, first by robbing a home run in the 8th, and later by clubbing the winning home run in the 11th, and then Jack Morris winning game 7, pitching 10 innings on sheer guts to win it 1-0. That game featured the classic "phantom" double-play, a sandlot baseball play – with Lonnie Smith on first, Pendleton hit a screamer into the gap in center, but the Twin infielders, Greg Gagne and Chuck Knoblauch, executed a fake double-play, as though the ball had been hit into the infield. Smith was running, his head down, thought he was out, and held up. By the time he realized what had happened, he was only able to make it to third (he should have scored easily), and Morris was able to get out of the inning a couple batters later with an intentional walk and an actual double play. Roger Angell of the The New Yorker wrote at the time that it was the best World Series he'd ever seen. In his wrap up of the season, he described how when Lonnie Smith took the batter's box before the start of game 7, he reached over and shook the hand of Brian Harper, the Twins' catcher, as if to say, "Has this been an incredible Series or what?" And it just got better. That's what I love about baseball – that joy of playing. Switching sports for just a moment, it's why I've loved watching Brett Favre play football for so many years – the sheer joy of playing. It allows you to forget what an ugly business too much of sports has gotten to be. One last baseball story: the last time I saw a Cubs game as a kid was when I was ten and my father was forty. When I was forty, I took my oldest son, then ten, to his first game at Wrigley Field. It felt as though I'd closed a circle, and that the circle was continuing on. You seem reasonably well spoken for a Cubs fan. I learned elocution from Harry Caray and Jack Brickhouse. I think Caray was with the White Sox when I studied with him. Holy cow! The '69 Cubs. The '86 Red Sox. Even the great Milwaukee "Harvey's Wallbangers" squad lost the title. What do you see as the cause for our fascination with players who make the big error or teams that lose the big game? Our fascination with notable losers is probably because they're us. The folks we're talking about got ALMOST to the pinnacle, farther than any other team save one. We love champions, but our own lives are filled with disappointments, heartbreak, sadness, failure, etc., etc. When our teams win, we're ecstatic, but when our teams lose after coming so close we can taste it – well, that's when they're most like us. The dramas, small and large, of our actual lives are enacted (metaphorically, of course) by the teams we cheer for. I've already talked about my own little breakdown over the '69 Cubs. I remember in '86, when I was watching game 6 of the Series, and with two outs and nobody on I called my then wife to come watch the final out so we could call her brother in Boston together and celebrate the ending of the curse. And we all know what happened. We watched one of the greatest comebacks/collapses of all time, as Boston simply could not get the final out. Bill Buckner, a really good player for almost his entire career, got tagged with the "goat" label, but he didn't do it by himself. People forget the tying run scored on a wild pitch earlier that same at bat. But the image is iconic: the ball – an easy out – rolling through a man's legs. How can you not empathize? Unless you are a Mets fan (and even if you are), your heart went out to Bill Buckner at that moment. It was such a human moment. To be so close, and yet... (And consider this: had Bill Buckner not been on two really creaky ankles in 1986, we would not have had to wait till 2007 for Boston fans to make themselves as obnoxious as Yankee fans, which is why, in turn, most of the country loved to see New England fail in the Super Bowl – order was restored to the universe, and once the Giants won, we could be commiserate with our New England friends – yes, yes, you were that close.) This is what makes great fiction work, too – people blunder, and it is their blunders that make the story. And baseball, of course, is rife with the poetry of failure. It's been written about a lot – a great hitter, say someone who bats .333, fails 67% of the time. The greatest hitters of all time, those who managed to hit .400, failed 60% of the time. You can have a long career in the major leagues failing 75% of the time as a batter. It's no accident that the most famous poem about baseball, "Casey at the Bat," is about a guy striking out, about a guy failing (interestingly, after two guys who are awful get on base to bring the mighty Casey to the plate). Sounds a lot like life to me. You describe yourself as "athletic." Yet, I've seen you play softball. Your fielding style could best be described as "unique." I don't have a question here. I'm just making a point. Hey, you're catching me in the twilight of my career. You should have seen me at 25, diving to my left, snaring a ball hit up the middle, stepping on the bag and pirouetting mid-air to fire a strike to first to complete a double play. My ex-wife saw me do that once and fell in love with me. Granted, that's not enough to base a marriage on, but you have to start somewhere. I'm 51 now. These days I can make those plays only in my mind – such is life. After two knee surgeries, a torn ACL and a torn Achilles tendon, I no longer go to my left as well as I used to. I'm playing shortstop still, when at my age I should probably swing around to second base. If I listened to my orthopod, I shouldn't be playing at all. And I only play once a year now – at the faculty-student Proser-Poet softball games at Warren Wilson. You will recall, however, that in the Proser-Poet softball game last year, I legged out a triple (a triple, my two-decades-and-change-younger-than-me-friend!) that scored the tying and go-ahead runs at the time. Sure, I then committed one of the great bone-headed base-running plays of all time, taking us out of the inning, but I was out only by about 50 feet or so. Had the base paths been 12 feet apart, I'd have scored easily! Another illustration of why I love baseball – a minor triumph followed by a failure. And we won the game, right? As for being athletic, Mr. Smarty-Pants, want to do a quick 68-mile bike ride with me up to Port Washington and back? I didn't think so. I can't. I'm really busy conducting and interview right now. Many connections jump out between the players you've mentioned as your favorites – Banks, Aparicio, Puckett. All had very ebullient personalities. All played great defense, which is so often overlooked. All were tough, durable competitors who rarely took a day off. Do you see any connections between what you love about your favorite players and your favorite writers? How does this relate to your favorite players and writers practicing their trade today? Ebullient writers who play defense? I don't know. I'm a sucker for writers with distinctive voices, usually generous, forgiving voices (though that's certainly not a requirement), and usually they have an ability to combine the comic with the tragic, or vice versa. If I start listing I'm sure I'll leave way too many names off, but the list would include such writers as Richard Russo, Lorrie Moore, Jaroslav Hasek, Antonya Nelson, Alice Munro, Anton Chekhov, Charles Baxter, Grace Paley, William Maxwell, Flannery O'Connor, Andre Dubus, Tobias Wolff, Robert Boswell, Andrea Barrett, Michael Martone, Louise Erdrich, and Milan Kundera. What I love about these writers is their vision, their habit of seeing the world and the way they describe it. The attention to detail – maybe that's what good defense is, the attention to detail. Voice, vision, detail – that's what they have in common, though the voices and the visions are all over the place. That's as it should be. The important thing is they've been places I haven't yet been, but by the time I'm done reading them I feel as though I have. They transport me. As did Banks, Aparicio, Pucket, and Robin Yount. What pitcher and/or writer you would most like to tee off against? Pitcher: Bob Gibson in his prime (though I'd probably have had a heart attack at the first high heater inside) or Satchel Paige. Writer: Chekhov. Would have loved to have talked shop with him. What is your World Series prediction for this year? You want my heart's prediction or my brain's? My heart says Brewers-Tigers, Brewers in 7. This would require the run-scoring of last year with a pitching staff capable of holding 3-run leads, which was a problem last year. My brain says Mets-Red Sox, with the Red Sox getting it right 22 years late, winning it in 6. By the way, we still have time for that bike ride. Nick Fox (1B/OF) – Bats R. Throws R. Slap hitter with occasional power to the alleys. Needs instruction. Good speed. Smart base runner. Solid defense at all positions. Currently signed to the MFA Program at Warren Wilson College through the end of the season, with a club option for 2009. Makes his home in New Orleans. Rabid White Sox fan.